Free quilling patterns can be a wonderful resource for people interested in learning more about this fun craft. The craft of quilling involves rolling long, thin strips of paper around a metal tool, then gluing the shapes together to form an elaborate design. Quilling is sometimes referred to as "paper filigree," since the shapes in a quilled design resemble metal scrollwork. Card makers often incorporate quilling into their projects, but quilling can also be used to make framed artwork, home décor pieces, accents for scrapbook pages, or even quilled jewelry. Most free quilling patterns incorporate the same basic techniques into the creation of the design, whether it's a flower, an animal, or an abstract geometric ornament. Once you can create these shapes with relative ease, you should be able to handle almost any type of quilling pattern imaginable. Tight rolls, sometimes called pegs, are used as centers or to elevate other shapes. A peacock eye is a tight roll made into a teardrop, pinched as hard as possible. An S scroll is made by coiling the ends of the paper in opposite directions. An open heart is made by folding the paper in half, then turning each side into a tight roll. Loose rolls are circles that can be pinched into shapes. A diamond is a loose roll with both ends evenly pinched at once. A square is a diamond turned one quarter, then pinched evenly. A rectangle is the same as a square, but with offset corners. A teardrop is a loose roll pinched at one end. A heart is a teardrop with the round end pinched inward. A triangle is made by rolling a loose circle, then pinching three points. You can see illustrations of each of the basic quilled shapes on the Witty Living website. If you review the LoveToKnow Crafts slideshow Paper Quilling Ideas, you can see how the color of paper used and the type of shapes combined together can give each quilling design a unique look. While there are many excellent reference books devoted to the craft of quilling, finding free quilling patterns online is a bit more complicated. Most sites only have one or two projects that have detailed instructions, although enterprising crafters may be able to figure out a pattern simply by deconstructing the final design into a series of basic quilling shapes. Whimsiquills has a number of free printable quilling patterns that can be used for your personal projects. This is a great resource for seasonal crafts, as there are lots of designs for St. Patrick's Day, Valentine's Day, Easter, Halloween, Thanksgiving, and Christmas quilling projects. The North American Quilling Guild posts free project patterns on a rotating basis, featuring designs created by various club members. Quilling, Art, and Expression is a blog that showcases paper crafting projects using quilling techniques. There are lots of interesting ideas for greeting cards and Artist Trading Cards. Reese Dixon has a tutorial for a pretty quilled snowflake ornament. Christmas Crafts has instructions for a quilled Christmas gift tag. 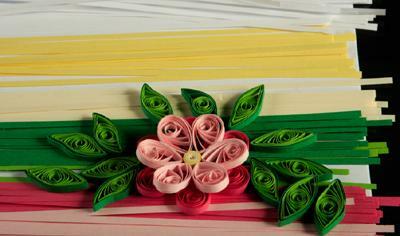 Craft Bits has a card making tutorial that showcases a nicely done quilled flower. The Quilling Patch is a blog focused on quilling and other forms of paper crafting. The site occasionally posts free patterns for visitors to enjoy. While quilling patterns can be very useful, sometimes it's helpful to see the process of quilling a design demonstrated. If you don't know anyone who is interested in quilling, there are plenty of wonderful tutorials available on YouTube. Plan to spend an hour or two going through the various projects, and you're sure to dramatically improve your quilling skills.